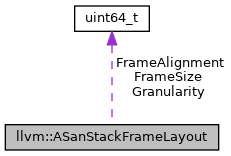 Definition at line 44 of file ASanStackFrameLayout.h. Definition at line 46 of file ASanStackFrameLayout.h. Definition at line 47 of file ASanStackFrameLayout.h. Referenced by llvm::GetShadowBytes(), and StackMallocSizeClass(). Definition at line 45 of file ASanStackFrameLayout.h. Referenced by llvm::ComputeASanStackFrameLayout(), llvm::GetShadowBytes(), llvm::GetShadowBytesAfterScope(), and StackMallocSizeClass().